It's Jenn again! I was wondering..... Are these roots healthy? She is flowering right now, so I want to wait to repot, but am pretty worried about these roots. It's a bit hard to tell without poking around in the pot, but those roots aren't looking great. Certainly the moss it's in is getting too old. I recommend repotting it into new moss promptly; the (slight) stress of repotting will be less than the stress of sitting in old moss. Moss tends to break down in a little over a year, so I like to repot plants growing in moss annually. Just follow my instructions for repotting and it should be fairly straightforward. Can I use something other than moss? Something longer lasting? Sure! Bark-based orchid potting mixes will last 2-3 years, or a lot of people have good luck with coconut husk chips, which last about the same amount of time. Either can be a good choice for Phals. Hello! Your site is awesome! May I share your article on my site and link at you as an author? 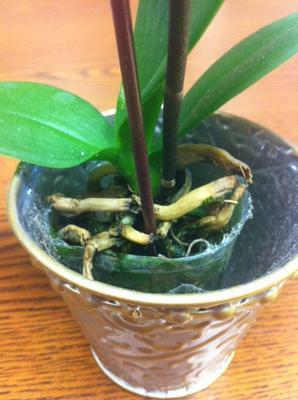 If you want to take care of your Orchid then get useful tips about healthy roots & Orchid care. Check out rushessay review first before making ant kind of important decision. This isn't bestsessays.biz essay writing or dissertation somewhere warm offerings and additionally just about everyone has you to ultimately treasure towards. All the vital home elevators reports steers kids on the most suitable area the moment getting creators and additionally assessing the grade of succeed make experience. With thanks! Looks like you need to re pot it before its too late. Don, t worry, please care of your plants and take water to these plants daily. Its will grow up in a few days. Join in and write your own page! It's easy to do. How? Simply click here to return to Growing Orchids for Beginners.